In this course you will learn how to banish, center, shield and ground as a precursor to non-dogmatic spirit work. In this Hands-On workshop, we will practice, test and refine your ability to banish, center and even uncross. We won’t just talk about these techniques; you will do them. This hands on and intense 90-minute workshop will be followed by a BATW session from Hands on Chaos Magic where you will actually banish a summoned entity in the store. That’s REAL Hands-On training from Andrieh. Using Hands on Chaos Magic along with some Bardon materials, Andrieh takes us down a tour de force of how to summon a spirit. Using the elemental forces as examples, Andrieh will demonstrate how to project outward to draw a spirit in. Each participant will have the opportunity to summon one elemental spirit and learn how to effectively communicate. We will cover how to separate out wishful thinking from what is going on with a first summoning. This powerful transformational workshop will be cap-stoned by an optional Full Ganesh Puja where we summon Ganesh as an example of one style of summoning. The final course of the Introduction to Spirit Work Series will be on invoking, or aspecting, a spirit. 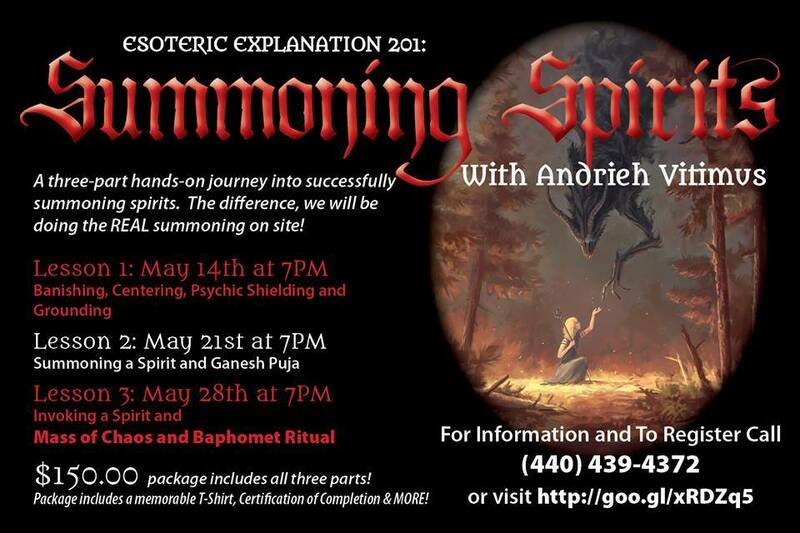 Andrieh will go over the benefits, problems, and How-To’s of REAL spirit invocation. Each willing participant will be guided into an invocation of a spirit. This work will shake many of you to your core in a fantastically evolving way. We reserve the right to ask you to pick a different spirit to invoke (so do bring a few choices), but we will try to accommodate all requests. At 9:30pm, following the 3rd workshop, we will perform a Mass of Chaos Baphomet (possibly to full possession). This ritual taps the primordial life force of the planet and has single handedly started many magicians down the path of magic. This ritual is strictly limited to participants 18yrs of age and older. This ritual is open to the public at a $20 investment which includes a consecrated Baphomet plaque. $150 for all 3 parts of the journey that includes a memorable T-Shirt, Certification of completion for the course in the Esoteric Exploration series offered by Spirit Apothecary, charged talismans we make in ritual, and MORE. Andrieh Vitimus is author of the modern magical classic Hands on Chaos Magic: Reality Manipulation Through the Ovayki Current, also published in Magick on the Edge anthology, Devoted, the Manifesting Prosperity anthology, Pillars III, The Pop Culture Anthology and the Best of Konton Magazine anthology. Vitimus is holds the highest initiatory rank in Haitian Vodou, that of Hougan Asogwe, is a Usui /Karuna Reiki Master, NLP practitioner, a licensed hypnotherapist, and has been a practicing sorcerer for 20 years. 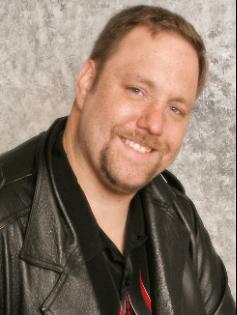 Currently, Andrieh Vitimus is faculty at Peter Carroll’s Arconorium College. Andrieh is the host of the internationally successful radio show, Deeper down the Rabbit Show (ddtrh.com) and has taught at conventions internationally.